What a beautiful way to greet the day. I whipped up this little gem on one of my days off. It was one of those awesome days where you stay up too late the night before, knowing you can sleep in the following morning…and that you will have the house to yourself for the day. You know – those rare days when you go where the mood strikes you – be it the mall, a road trip, or simply to the couch. Watch some movies! Clean the house! Dance with the cats! I got up at my leisure and made some fresh-ground coffee and pondered breakfast. What would satisfy the need for something delicious to start the day, but not so overwhelming as to ruin my plans for a yummy lunch later? Sipping from a giant mug of steaming java, I mulled it over. I prefer savory to sweet, as a rule. I knew I had Pancetta on hand, and a couple of loaves of artisan bread from the bakery. I had always wanted to master the art of egg poaching – no time like the present. And breakfast was born. Have all of your items on hand – this all goes fairly quickly. Start heating a small pot of water if you will be poaching. Butter both sides of your bread with garlic butter, and set aside. Cook your pancetta slices in a skillet on medium heat, just until they begin to brown. Remove and set aside. Place your garlic-buttered bread in the pancetta skillet over medium heat. When it begins to brown on the bottom, flip it over, and place the cheese and then the pancetta on top of one of the slices. Turn the heat down to simmer. The water should be gently boiling. You can add a couple of teaspoons of white vinegar to help hold the white together. Fresh eggs work better for poaching, while aged eggs are better for boiling. Carefully crack the egg into a small bowl or custard cup and set aside – never crack the egg directly into the pot. Using a spoon, swirl the gently boiling water in one direction, creating a whirlpool. Keep it spinning! Carefully release the egg into the center of the vortex – don’t drop it. The combination of the swirling water the vinegar should prevent feathering. Continue to gently swirl the water by running a spoon along the outer edge of the water. Cook for 2 minutes for runny eggs, 3 minutes for medium, and 4 minutes for hard. Gently remove with a slotted spoon, and set on a paper towel to absorb the extra water. You can then just roll the egg off the paper towel to serve. Whatever egg you choose, it is time to assemble. 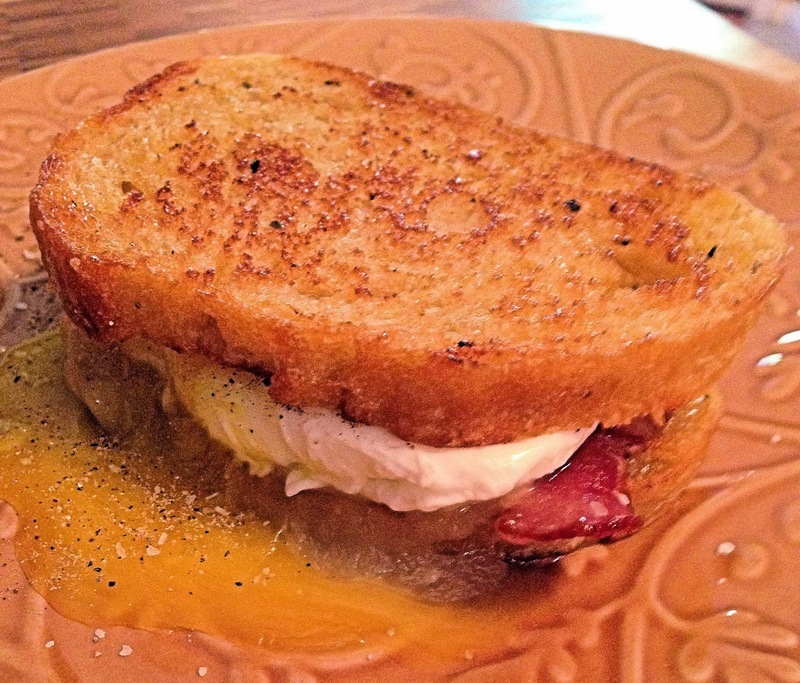 Place the cheesy pancetta toast on a plate and top with your egg(s). Salt and pepper to taste, and top with the remaining garlic toast slice.